For the type of French criminal, see Chauffeur (criminal). A chauffeur is a person employed to drive a passenger motor vehicle, especially a luxury vehicle such as a large sedan or limousine. A woman employed to drive a passenger motor vehicle is a chauffeuse. In addition to the minimum legal requirements, limousine companies often require their chauffeurs to undergo specific extra training. These courses may involve evasive driving or defensive driving techniques, the proper methods to ensure safety in the most extreme conditions such as inclement weather, a flat tire at high speeds, or other exterior influences for loss of vehicular control, etc. Most companies also have their own courses as to what they expect from their chauffeurs. Chauffeurs may be taught proper etiquette for use when they are in presence of their clientele. 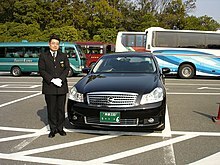 They may also be trained for services to the client beyond the car itself, such as for a personal valet or bodyguard. Many companies and local licensing agencies currently require random drug screening – in the United States this was especially the case after professional ice hockey player Vladimir Konstantinov's career-ending injuries when his recently hired chauffeur, Richard Gnida, already serving a license suspension for drunken driving, lost control of their limousine and crashed, seriously injuring Konstantinov and his other passengers. Female chauffeur in "Desert Rose"
^ "CHAUFFEURS LORD IT OVER THEIR EMPLOYERS; Big Salaries Turn the Heads of Automobile Drivers. THEY SCORN MENIAL WORK Garage Managers Also Have Trouble with Them -- A Better Class Being Turned Out by the Schools". The New York Times. The New York Times Company. 12 August 1906. p. 16. Retrieved 12 December 2016. ^ a b Sanger, David E. (September 23, 2010). "Once Around the Block, James, and Pick Me Up After My Nap". The New York Times. The New York Times Company. p. 7. Retrieved October 31, 2010. ^ Stern, Linda (October 1, 2007). "Hey, Look, Boss: No Hands!". Newsweek. Archived from the original on 14 September 2009. Retrieved 14 November 2009. ^ Villano, Matt (September 17, 2007). "A Chauffeur Role That Tries Harder". The New York Times. The New York Times Company. Retrieved 14 November 2009. ^ "Too Old To Drive?". The Rachael Ray Show. MMVII KWP STUDIOS INC. October 10, 2007. Archived from the original on 11 January 2008. Retrieved 14 November 2009. ^ "How to become a licensed taxi or private hire driver" (PDF). Transport for London. Mayor of London. Retrieved 25 November 2018. ^ "FAQ". NYC Taxi and Limousine Commission. Archived from the original on May 28, 2010. Retrieved 25 November 2018. ^ Becker, Mark (1 November 1998). "Operators Abroad Attempt to Establish Uniformity in Chauffeur Training". Limousine, Charter, and Tour Magazine. Retrieved 29 August 2013. ^ Fletcher, Scott (1 March 1992). "Limousine Clients Deserve Drug-free Chauffeurs". Limousine, Charter, and Tour Magazine. Retrieved 29 August 2013. ^ Windsor, Shawn (6 October 2007). "2007'S TOP WINGS STORIES: Remembering the crash that ruined Stanley Cup celebration". Freep.com. Gannett. Archived from the original on 7 June 2011. Thirty-two laws took effect in 1999 amid mounting evidence that thousands of people with suspended or revoked licenses were driving, despite numerous alcohol-related convictions and serious traffic violations. ^ AP (July 2, 1999). "Ex-Wings Limo Driver Arrested". CBS News. CBS Interactive Inc. Retrieved 19 September 2008. ^ Thomas Jr., Robert McG. (25 May 1995). "Roosevelt S. Zanders, Stars' Chauffeur, Dies at 81". The New York Times. The New York Times Company. p. 8. Retrieved 25 November 2018. Look up chauffeur in Wiktionary, the free dictionary.